CSV Excel Macro Injection, also known as Formula Injection or CSV Injection, is an attack technique which we use in the day to day penetration testing of the application. CSV injection is a vulnerability which affects applications having the export spreadsheets functionality. These spreadsheets generate dynamically from invalidated or unfiltered user inputs. Modern web applications offer spreadsheet export function these days. This allows the user to download data in a .csv file format or .xls file format. This is suitable for handling spreadsheet applications like MS-Excel and OpenOffice Calc as a result of which the cells in the spreadsheets can contain inputs from untrusted source. As a result, the end user who is accessing the exported spreadsheet can be affected. This vulnerability can be used by an attacker to execute attacks such as client-side command injection or code injection. Basically, the attack scenario for this is purely targeting the user(s) who download the Excel file naturally. We usually disregard this attack as a non-issue. However, websites should still be aware that the information they are exporting can potentially affect the users. CSV excel macro injection can be exploited when the application supports export to excel functionality. This happens on spreadsheet files which dynamically generate from invalidated input data. We can use formulae which we use in excel for carrying out operations to test for formula injection on websites. This vulnerability occurs due to the concept of dynamic Data exchange(DDE). DDE is a protocol for interprocess communication under windows supported by MS-Excel, LibreOffice and Apache OpenOffice. As you can see in the above screenshots, our payload adds to the input fields. Now, once we export this record to an excel file, our payload informs the program to run an application called cmd.exe with the command /C calc which executes calc.exe from the command line. Once the excel file is open calc.exe will be executed as shown in the screenshot below. Mostly these payloads are all fine and well. But, sometimes the = character filters out. However we can use some different combinations such as @, + or – . So, current payload of choice for exploiting this as a proof of concept is. In conclusion, I recommend that it is always agood practice not to trust user inputs and always encode the output. 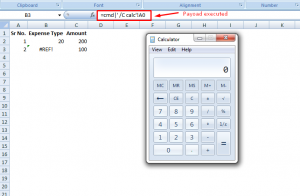 Also, for the successful execution of the formula, attacker will have to use the ‘-‘ , ‘=’ , and the pipe (|) is used to execute the binary in the excel software. Hence, it is strongly recommended to filter the ‘- ‘, ‘|’ , ‘+’ and ‘=’ to mitigate this vulnerabilty.